The Edmond Amateur Radio Society will hold its fall TRY HAM RADIO event at Edmond North High School on September 10th from 9:00 a.m. to noon. The event is free and open to the public. HF operations in the south parking lot will work as a GOTA staton. Know someone interested in ham radio? We'd love to show them around. EARS Technician Licensing Class starts 9/20/11 at 6:30 p.m. at the Community Center, Main and Littler, in downtown Edmond. $40 cost covers text and test. More details at K5EOK.org. First, I would like to congratulate the following list of stations that sent their logs to the League for Field Day credit. It’s always fun to see “how we did” compared to similar stations. Even if you only made 10 contacts, you get your station in QST!! So, here they are…..again Congrats and thanks for participating! Also, I received a URL to a special event station web site to commemorate 9/11. I wanted to pass it on so everyone in the section has the opportunity to try to contact them….they are the Northeast Wireless Radio Club in Queens County, New York. Well, the move to Perry is complete, Field Day is over and Ham Holiday 2011 is in the books. Not to mention, Wilma (the XYL), W5WRO and I are new grandparents. Wilma’s daughter gave birth to a baby boy on July 20, 7 lbs. 2 oz. and 19” long. I’m already planning to expose him to CW, RF and classic rock and roll ASAP. The first weekend in June was the Plano Hamfest and ARRL National Convention. Wilma and I traveled to Plano Thursday morning to help with setup and get squared away. The West Gulf Division played host to the crew from Newington as well as many volunteers helping to man the ARRL Expo. Thursday evening we were treated to a dinner at Southfork Ranch. So the folks from back east got a good dose of southern hospitality. The hamfest was a great success. Lots of hams came by the ARRL Expo and got to meet and chat with numerous members of the headquarters staff. The got questions answered, pictures taken and even kits built. The keynote speaker was Riley Hollingsworth and there was standing room only. Everyone had a really great time, so if you missed this one, you missed a great one. The weekend after the move was Field Day. I left Perry at around 6:30am Saturday morning and picked up Asst. SM Jim Shideler, W5JCS in Stillwater and headed for our first stop, Bartlesville. The club has a great site out at Osage Hills State Park. The guys were working on antenna installations while we were there. From Bartlesville we drove south to Tulsa to the Broken Arrow clubs site just off 71st and Mingo. They already had some folks on the air testing stations while others continued to erect antennas. They had RSVP’s from about 200 or so for dinner Saturday night!! It was then on to Chandler Park on Tulsa’s west side to the TARC/TRO site. This was a really nice site with lots of places to erect towers and string wire. The only down side, the breeze they had at Broken Arrow, was blowing rather briskly on top of that hill. With the heat starting to build, Jim and I headed down the turnpike and south at Chandler to Shawnee. They had a small tailgate fest to go along with Field Day. They were giving VE Exams and had one station up and running (Way to hang in there Beth). Moving west, we made our way to Norman and the SCARS site in a park off of Jenkins on the south side of campus. They were hard at it on phone, CW and I believe they had a digital station running as well. They were running at least 3A with a GOTA. With Bill Wilburn, N5NUK running “blocker” we made our way to the OCAPA site out at “Lake” (read channel with a stream at the bottom) Stanley Draper. This was a great site with nice pavilions overlooking where the lake would normally be. Which provided a great location for the antennas. While we were there the local police came by to roust them…….of course there is always one person that doesn’t get the memo……….so Tom Webb, WA9AFM had to produce the documents signed by 4 different agencies proving they were allowed to be there. I was glad the cuffs didn’t come out. After the brush with the law, we traveled over the FAA club site on the SW side of OKC. They had a large tent from OKC emergency Management. This tent was really cool……..and I do mean COOL! It was AIR CONDITIONED and insulated!! When I went in, I told them this couldn’t be a Field Day site in the outdoors, “cause you aren’t sweating!” It was a nice installation where they were even running satellite. Our last stop was the EARS site north of Edmond. They were set up in one of the area fire station and everyone was having a great time. The only bummer was that we missed the Bar-B-Q dinner by about an hour. But, there were some great left over desserts…….especially the marshmallow treats! All in all we visited 8 sites of the 13 listed on the League site finder and traveled 475 miles. We had a great time, met a lot of great folks and saw lots of different ways of setting up Field day. I would like to thanks all of the clubs for their hospitality, cool water and efforts to put on a great Field Day. June and July saw lots of heat and dry conditions in the section. There have been numerous grassfires with thousands of acres scorched. We even had severe storms that caused some loss of life. All these events saw some of our amateurs assisting in a variety of ways, from storm spotting to helping coordinate delivery of drinking water to firefighters. ARES Oklahoma has been busy in these events. They have also been busy in the planning area. On July 16th, the ARES Oklahoma senior staff (SM, SEC, ASEC’s and ZEC’s) met in Oklahoma City to cover a lot of topics to get everyone on the same page as to where ARES Oklahoma is headed. We are in the process of re-writing the Section Emergency Plan. This re-write is to smooth out some of the language in the plan, NOT to make substantive changes. SEC, Mark Conklin, N7XYO is doing a great job coordinating the ARES effort. Also, ASEC for IT, Roland Stolfa, KC5UNL, is doing GREAT work with the ARESOK website. Ham Holiday in Oklahoma City was a good gig. They tried a few new things and I feel like they succeeded. The first was a Ham Holiday banquet Friday evening. The food was good, with some really great apple pie. I got to present an A-1 Operator Award to Richard Schroeder, N5VYQ and give Dave Duskin, NE5S some static about 80 meter operation and his garage door opener……. The hamfest had most of the usual suspects in attendance. Plus we had the West Gulf Division Vice-Director John Stratton, N5AUS on hand to rib about being a lawyer. (some things you just can’t get enough of) It was good to see a lot of good friends and to make new ones. I want to express my appreciation to all the folks in CORA for a job VERY well done. I look forward to next year’s Ham Holiday. Texhoma Hamarama – West Gulf Division Convention – October 21-22 – Ardmore Convention Center, Ardmore, OK. I plan on being at these hamfests and look forward to meeting you. One of the great things about being you Section Manager is getting to meet all the great hams in our section. Many times a fellow ham will come up to me and thank me for taking on this position, but it is I that would like to thank all of you for what you do everyday to make amateur radio the great hobby it is. So, hats off to all of you. My sincere thanks. Dam Jam 2011, 20th Anniversary Event - September 10th. 500+ bikers in a 75 mile ride in Pryor, OK. Mobile operators (handhelds could be useful as well) are needed to help with sag, sweeps, and support. 6am-4pm. Fuel reimbursement, meal in the park, and volunteer shirts available for those who commit in advance. Contact Jim Beach damjamjim@gmail.com or Tom Stroud kd5oph@tulsahamradio.org. Bike MS 150 - September 17th and 18th. 800 bikes in a 150 mile ride from Tulsa to Oklahoma City with a stop overnight in Chandler, OK. Safety, sag and sweep operations. Fuel reimbursement; food and drinks along the route; and breakfast, lunch and dinner on Saturday and Sunday. Most of the communications will be on repeater so mobile units will be the choice of the day. Bike racks would be a plus if you are not in pick-up truck. You can work both or just one day. Contact Tom Stroud, 918-695-3735 or kd5oph@tulsahamreadio.org. Williams Route 66 Marathon - October and November, approx. 5,000 in attendance). Williams Committee is renting a private repeater and private band radios. Training day will be scheduled. Contact Tom Stroud, 918-695-3735 or kd5oph@tulsahamreadio.org for more information. Pink HAMsters will have their monthly fellowship get-together on August 25, 6:00 pm. at Panera Bread (between 71st and 81st on Aspen, Broken Arrow). 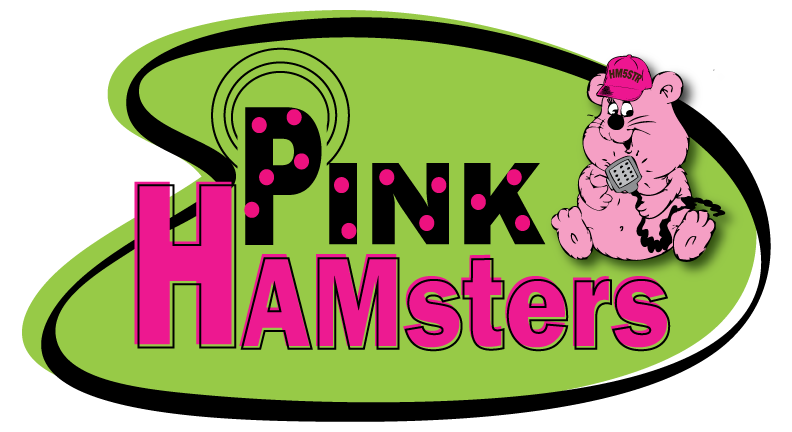 Pink HAMsters is ham radio from a feminine perspective. You DO NOT have to be a ham operator to attend this event. This get-together is for women who are licensed ham radio operators or who are related to a ham operators. The purpose of this get-together is fellowship and fun and good food. The conversations are NOT all about ham radio. We talk about anything from home decor to travel to book publishing! Questions? Email Cindy Downes cindy@me.com or Kim Turentine Kturent@yahoo.com. PS: Pink HAMsters Net, Mondays at 7:00pm, 146.91 Broken Arrow. Kim Turentine is Net Operator. The Boy Scouts have their Fall Festival on September 17th at the Jack Graves Scout Reservation in Broken Arrow, OK.
We are looking for a team of 2-4 that would like to attend this event and represent ham radio to the scouts. Contact Tom Stroud KD5OPH, 918-695-3735 or email at kd5oph@tulsahamradio.org for more info and to sign up. Get ready! ARES leaders have you recruited enough leaders and volunteers to support your ARES-OK teams in your area? Now is a good time to find out and get ready for the 2011 Simulated Emergency Test (SET) -SATURDAY October 1, 2011. For an overview see the guidelines below... more info will follow as we get close this years date. The ARRL Simulated Emergency Test is a nationwide exercise in emergency communications, administered by ARRL Field Organization Leaders including Emergency Coordinators, District Emergency Coordinators, Section Emergency Coordinators and Net Managers. Many other Section Leaders like the Section Manager and the Section Traffic Manager may have a hand in planning the exercises and/or reviewing the results. Amateur Radio Emergency Service ® (ARES®), National Traffic System (NTS), Radio Amateur Civil Emergency Service (RACES) and other public-service oriented groups can be involved. The SET weekend gives communicators the opportunity to focus on the emergency-communications capability within your community while interacting with NTS nets. Although the main SET weekend this year is October 1-2, local and section-wide exercises may be held throughout the fall season. To participate in this year’s emergency test, contact yourlocal ARES-OK County and District level emergency coordinators to find out the details. ARES-OK teams will conduct their exercises on SATURDAY OCTOBER 1, 2011. If you don’t know who your local contact is, please got to www.ARESOK.orglog in (new volunteers click apply) fand find your ARES-OK County and District level emergency coordinators for assistance. Whether you’re a new licensee or an experienced radio amateur, the SET is a golden opportunity to learn or practice useful skills in traffic handling, net operation and emergency communications protocols and management. 1. To find out the strengths and weaknesses of ARES, NTS, and other groups in providing emergency communications. 2. To provide a public demonstration--to served agencies such as the American Red Cross, the emergency management agency and through the news media--of the value to the public that Amateur Radio provides, particularly in time of need. 3. To help radio amateurs gain experience in communications using standard procedures and a variety of modes under simulated-emergency conditions. The scoring format reflects broad objectives and encourages use of digital modes for handling high-volume traffic and point-to-point Welfare reports out of the affected simulated- disaster area. Participants will find SET an opportunity to strengthen the VHF-HF link at the local level, thereby ensuring that ARES and NTS are working in concert. The SET will give all levels of NTS the chance to handle exercise-related traffic. The guidelines also recognize tactical traffic on behalf of served agencies. Test messages should carry the word "TEST" before the precedence; that is, "Test Priority" on phone and "TEST P" on cw. The text of such messages should also begin with the words "TEST MESSAGE." ARES units and other groups are free to conduct their emergency exercises anytime between September and December if an alternative date is preferred. The activity period should not exceed 48 hours. You may e-mail your SET summaries to ARRL Headquarters viasewald@arrl.org. If you mail them to ARRL via the postal service, the address is: ARRL Headquarters, 225 Main Street, Newington, CT06111-1494. February 1, 2012, is the receipt deadline. 1. Sign up all available amateurs in the area under your jurisdiction and work them into your SET plans. 2. Call a meeting of all ARES members and prospective members to briefly outline (no details!) SET activities, and give general instructions. Do not divulge the exact time or nature of the test to them at this time. This should come as a surprise. Take this opportunity to register new ARES members and get up-to-date information on others. Hold an on-the-air meeting if it's not possible to meet in person. 3. Contact served agencies and explain the intent and overall purpose of the SET. Offer to send test messages to other branches of their agencies, and invite officials to your ARES meetings and SET operating sites. 4. Contact officials of any adjacent communities having no active amateurs and offer to provide representation in amateur networks for them as well. 5. Arrange publicity in consultation with an ARRL Public Information Officer in local newspapers and radio/TV stations by preparing an announcement and/or inviting the press to observe your group's SET operation. 6. Set up liaison with one or more NTS local/section nets (if you don't already have liaison) so you will have an outlet for all messages out of the local area. 7. Formulate your plans around a simulated disaster. Possible "plots" include: a flood, a serious fire, an ice storm, a missing person, a serious accident (automobile, bus, aircraft, for examples), a broken gas line, and so forth. Elaborate on the situation by developing a scenario, but please be realistic. 1. Announce the emergency situation. Activate the emergency net. Dispatch mobiles to served agencies. 2. Have designated stations originate messages on behalf of served agencies. Test messages may be sent simulating requests for supplies. Simulated emergency messages (just like real emergency messages) should be signed by an authorized official. 3. Emphasize tactical communications for served agencies. 4. As warranted by traffic loads, have liaison stations on hand to receive traffic on the local net and relay to your section net. You should also be sure that there is a representative on each session of the section net to receive traffic going to the local area. 5. Operate at least one session (or substantial segment of a session) of the local net on emergency-only basis. Or, if a repeater is on emergency power, allow only emergency-powered stations to operate through the repeater for a certain time period. An important post-SET activity is a critique session to discuss the test results. All ARES (and RACES) members should be invited to the meeting to review good points and weaknesses apparent in the drill. Emphasize ways to improve procedures, techniques, and coordination with all groups involved. Report your group's effort using the appropriate forms and include any photos, clippings and other items of interest. The main function of the National Traffic System in an emergency situation is to tie together all of the various local activities and to provide a means by which all traffic destined outside of a local area, section or region can be systematically relayed to the addressee. Normal NTS routing should be followed. A valid exception is the handling of emergency traffic that should be routed as rapidly and efficiently as possible, bypassing various levels of nets when delivery can be expedited. Another exception is when one station is loaded down with traffic for one region or section. At the discretion of the Net Control Station (NCS), the station may be directed to bypass a normal channel and go directly to a lower (or higher) echelon net. The interface between NTS and ARES lies in the liaison function between local nets and other NTS nets, particularly at the section level. Responsibility for representation of the local network on the section net lies with the local net manager who may or may not be the EC. Although we usually think of ARES members being the representatives in section nets, it is equally valid to expect NTS personnel to act as liaison to local nets. At least one net session or substantial segment of a session should be conducted on emergency power. Plan a surprise session or two. Advise the NCS just before net time. If NCS is unable to operate on emergency power, then someone else must be net control. Only stations operating on emergency power may report in during this time. One of the first steps on the way to a successful SET is to try to get as many people involved as possible, and especially new hams. In a real emergency, we find amateurs with all sorts of varied interests coming out of the woodwork. Let's get them involved in SET so they will know more about how emergency communications should be handled. Promote SET on nets and repeaters, and sign up new, enthusiastic radio amateurs. Many of those offering to help will be inexperienced in public-service activities. It's up to you to explain what's going on to them, and provide them with useful roles. They may like it so much that they become a permanent fixture in your ARES or NTS group. For a review of last year's nationwide Simulated Emergency Test, read the article in July, 2011, QST. Thanks to your efforts, the public service tradition in Amateur Radio continues! By now I hope you are aware of FEMA's "National Preparedness Month"
One problem I spotted is that many ham folks are not sure what "group"
First - list your group under the non-profit category on their website. ago, but it disappeared and may or may not be stable. Radio" somewhere in your group name - even as a suffix. Neither of these suggestions is a definite fix, but they should help. other, let's get the recognition. Field Instructors are volunteers who commit their time and expertise to offer classroom instruction of the ARRL Amateur Radio Emergency Communications Course. Volunteer instructors may now conduct classroom instruction covering the material in the new Introduction to Emergency Communication course. The August Oklahoma City Auto-Patch Association meeting will be held on Tuesday, 16 August, 7:30 PM at the Citadel located 1 block west of SE 44th & Bryant. VE Testing begins at 6:00 PM. officers as well as discussion and coordination of the Tech class which will begin on 25 August. Championships' which will be held in Boston in 2014. Thanks to WA9AFM for this report. ARES Oklahoma is seeking nominations for some several District Emergency Coordinator (DEC) leadership positions. Do you know a fellow amateur operator who would be a good choice for a leader with ARES-OK OR would you like to be a candidate for theses appointments? Please send your nominations to your regions Zone Emergency Coordinator (ZEC) by logging into www.ARESOK.org where you will find your ZECs contact information. Or is you would like to be considered for the position you can directly apply for the position www.ARESOK.org. good materials for newsletters and promotional media for free from them. post pictures and stories on their national website too. It's a no-brainer for PIOs and national exposure. Coalition Members as well as FEMA representatives. the National and Regional level. other groups have done for inspiration. this year's toolkit, banners, and customizable materials. The Lawton Ft. Sill Amateur Radio Club announces its fall class schedule for the Technician class amateur radio license. This is the entry level, no code, class often used by those who want to get into the craft for the first time. The class will begin on Sept. 10 in room 313 at the Great Plains Technology Center. The classes are conducted between 9:00 a.m. and noon on Saturday mornings. The class will run for 6 Saturdays and ending on October 15. Classes are taught by club members many of whom are long time enthusiasts with many years of experience. There is no charge for the class, but a text is required. Students are asked to bring $30.00 in correct change for the text. Students are asked to park on the west side of the building 300 for easy access to the classroom.. If you need additional information, call 580-353-0932. Thanks to WB5YZD for this information.